The 3D concert movie is a relatively recent but burgeoning phenomenon, particularly amongst tween fans of contemporary pop music. Although most pop artists and groups that make it onto the stereoscopic big screen have multi-million dollar contracts in place and are in no need for extra publicity, they do benefit from the brand extension offered by the 3D movie. In particular, the inflated 3D ticket prices neatly mark another path to gain profits from fans who have already purchased the traditional merchandise sets and/or cannot make it to the live concerts. Many of the movies such as Katy Perry: Part of Me 3D (2012), Jonas Brothers: The 3D Concert Experience (2009), Glee: The 3D Concert Movie (2011), Justin Bieber: Never Say Never (2011) and Hannah Montana & Miley Cyrus: Best of Both Worlds Concert (2008) are not strictly concert movies in that they frequently include bio-pic and other documentary footage. They are also often fleeting in their theatrical runs. 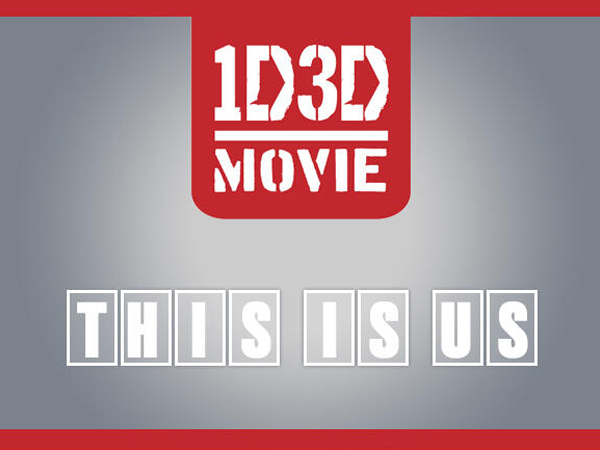 For this reason, and mainly because I am not part of the target demographic, I hadn’t seen a 3D concert movie until I went to see One Direction: This Is Us at the weekend. I was one of very few adults over 20 years old who were not there to accompany excited young girls. I was also blissfully unaware of the songs and the hype created by One Direction until it was drummed in to me repeatedly during the film. My feeling is that the cinema could have shown the film on an old VHS tape and the audience would still have been thrilled to see it. Nonetheless, the film shows off its digital 3D effects from the very beginning. The start of the films shows still images, layered on top of one another, and popping out into the auditorium on different depth planes. The stills (often family snapshots) are accompanied by voice-overs from One Direction’s group members but do not make it clear who is being depicted. Instead, it is up to the audience to recognise, by voice alone, which of the stars is talking. This elicits gasps and excitement from the, mainly, teenage girls who are not only thrilled to be hearing the words of the pop stars but also able to exhibit their status as fan and owner of the cultural capital that comes from this recognition. When the film opens on to one of One Direction’s concerts the cameras situate us at various places in the stadium with the effect that we seem to be amongst the audience. Throughout the concert footage, direct communication and engagement is emphasised. Girl fans (they are never boys) scream at us in slow motion as if we were right in front of them. Group members look directly into the cameras and sing, as if for us. Although the group members are often hanging towards us just slightly in negative parallax, there are shots when their microphones protrude directly into the auditorium. During later concert footage visual graphics, in the form of fireworks, pixelated computer characters and song lyrics, seem to shoot off the screens behind One Direction and dart into and around the auditorium. These are the gimmicky 3D effects that recent 3D films have attempted to eschew. Discussion by 3D filmmakers, critics and publicists have adamantly emphasised the need to get rid of ‘off the screen’ effects, to tone down 3D and make it more natural in order to appear palatable to audiences. However these effects were greeted with cheers and thrilled exclamations by the audience in the auditorium. 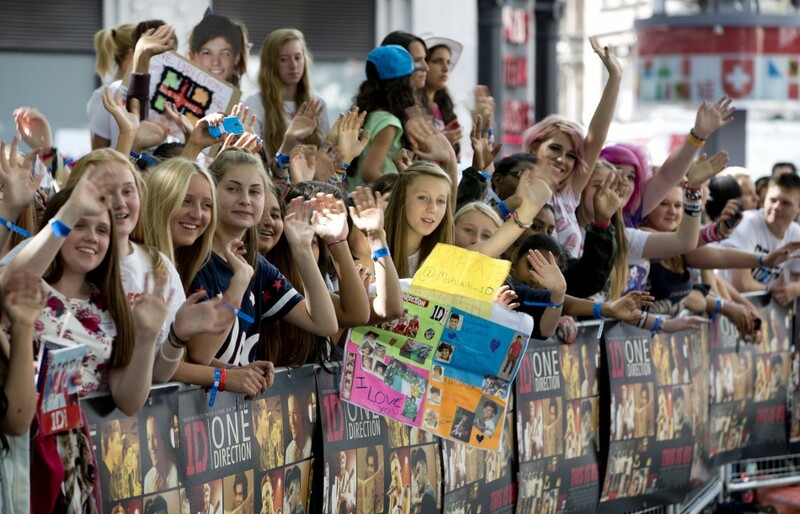 At one point in the film, a scientist is introduced to explain the chemical reaction that takes place when fans engage with One Direction. Comparing the effect of listening to the music and engaging in frantic fan activities to the process of participating in sports events that produce dopamine, the scientist states that the girls are not crazy, just experiencing high levels of excitement. Much of this excitement seems to come from the full-bodied sensory overload that takes place in fan events, either at the concerts or when waiting in mass groups to see the group members on the street. It is this sensory overload that the 3D elements of the film heighten further and, for fans far away in a cinema auditorium, allows them to feel the One Direction experience just a little more closely. It is a shame then that the footage between the concerts is so consistently flat. The rest of the film covers the back-story of the group as they rose to fame, (following their consolidation on The X Factor TV show), conducts interviews to find out how they now feel about their fame, and shows the group taking part in various activities between the shows. Although all of the archive footage has been converted into 3D and the remainder of the material is also in 3D, there is very little sense of depth. Apart from a few aerial shots of cities the group visits, such as London, little attention has been given to creating a sense of deep space. This doesn’t seem to be unique to One Direction: This Is Us as similar thoughts have been written about Katy Perry’s concert movie. The technology was definitely in place and 3Ality were taken on board to show case a number of new Sony cameras. During the concerts, footage was filmed with eight 3D rigs, numerous cameras and steadycam set-ups yet I haven’t found any evidence of 3D technology that was used for the non-concert shots. 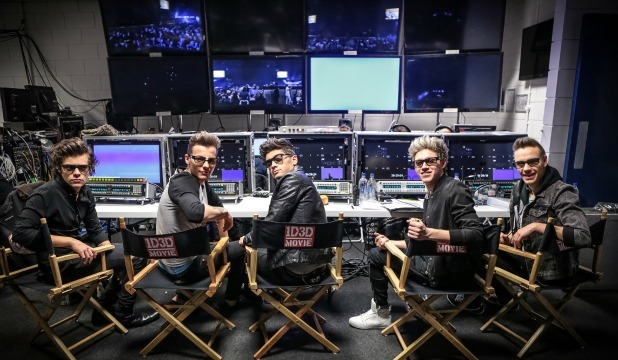 The interim footage also has the tendency to go round in circles, repeating the same themes (everything One Direction does is for the fans) and the same images (jocular young men fooling around in cheeky poses). 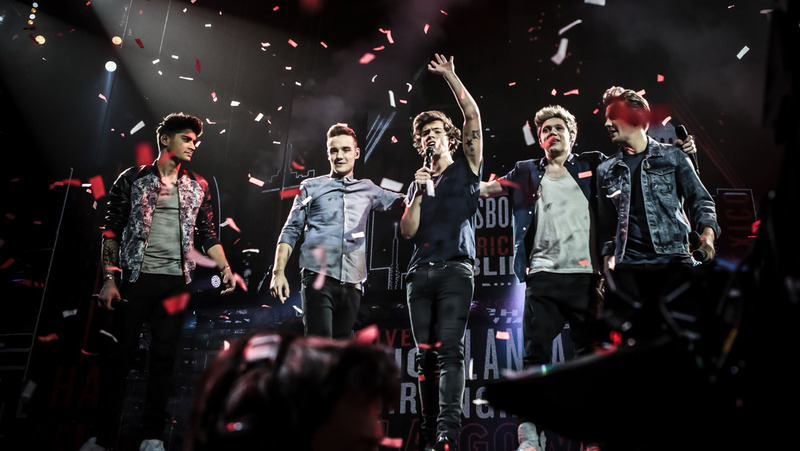 While the film does not offer anything in the way of advancing either documentary or concert movie traditions, and will have a relatively limited shelf life, it does give fans an up-close, experiential look at One Direction. For those that can’t make the concerts, this is as close as they are likely to get.